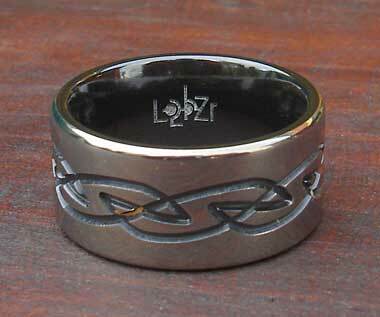 Celtic Style Ring For Men : LOVE2HAVE in the UK! 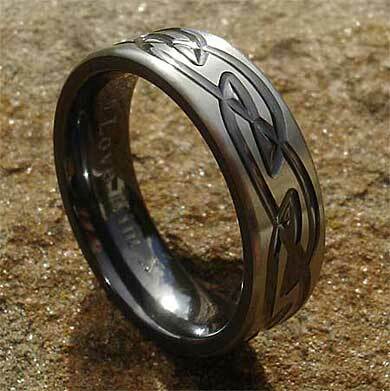 A relieved, black Celtic ring for men in a satin or polished finish. By relieved, we mean that the patterning is black while the outer zirconium surfacing is grey. This industrial effect, created by machine skimming away what would have been a black surface on the ring, is magnificent with the satin version looking like silky velvet and the polished, almost mirror-like in appearance. The width here is 7mm, but we can go up to 12mm wide. However, the engraving remains the same width on all versions. 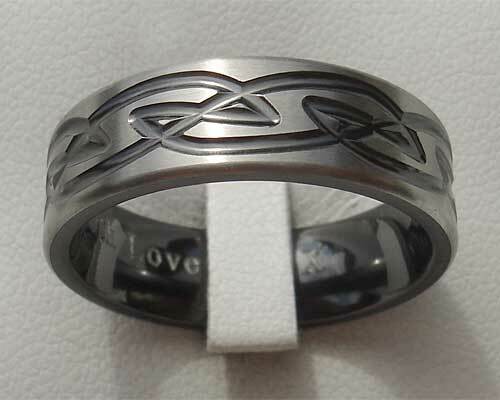 The geometric design featured on this ring and directly inspired by the spirals and Knotwork created by the Celts are commonly found in ancient Celtic books and other manuscripts. 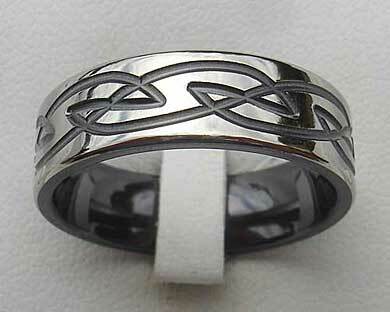 This ring makes an excellent choice for a men's Celtic ring with contemporary styling. The polished version pictured below comes with rounded edges as featured. An all over black version is also available on our website.